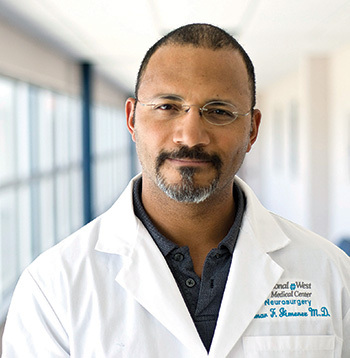 Neurosurgeon Omar Jimenez, MD, opened his Scottsbluff practice in 2007. Call him at 308-630-1947 at your convenience and get honest, straightforward answers to your questions. Dr. Jimenez is a graduate of the George Washington University School of Medicine. He completed a surgical internship at the University of Massachusetts School of Medicine, and completed both a neurosurgery residency and neurosurgery spine fellowship at Jackson Memorial Hospital at the University of Miami. He specializes in both minimally invasive spinal surgery and disc replacement surgery.